Battery life has always been a concern with a lot of Android phones. 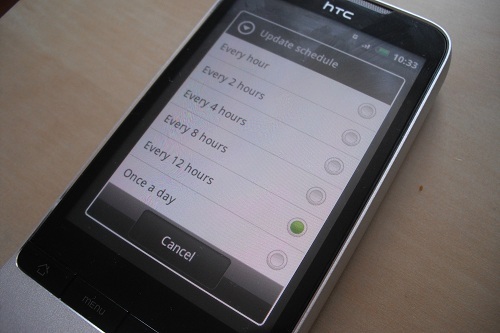 In extreme cases, devices like the US-only HTC Evo 4G would only manage four hours with heavy use. The Desire HD is also another device that has battery life issues; it’s clear to see that Android and large, bright screens isn’t a good combination. 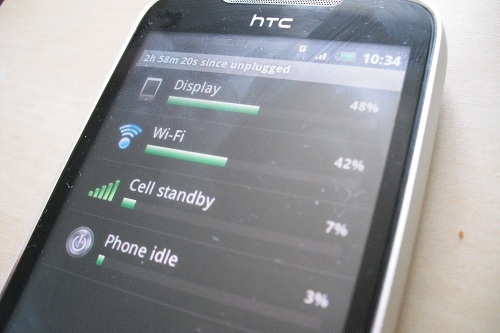 There are, however, a few different ways to maximise your Android phone’s battery life, whichever device you use. Syncing is one of Android’s strongest features; all of your data from Facebook, Twitter, Google, etc is constantly being synced back and forth from your device to ‘the cloud’. Android allows you to change the frequency of background data syncing. For example, you will have a few different options for when your phone will sync your Facebook data. 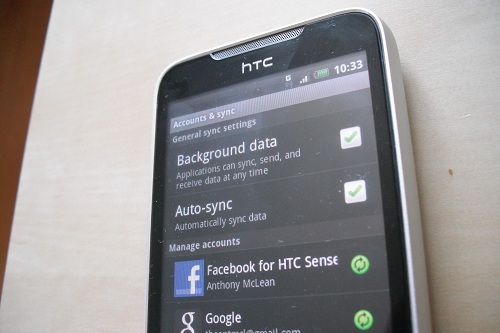 I have my HTC Legend sync my Facebook contacts data every 12 hours, and my weather data every hour. On average, I can get about 14 hours of battery life with heavy use, and close to 17 hours with light use, with normal use somewhere in between. I try to look at what syncing I need to prioritise, so things like Facebook and Friend Stream I only set to sync once a day, as I only really use them once a day. On the other hand, I like to keep my weather widget as up-to-date as possible, so that’s set to sync every hour (the lowest frequency setting). Data is a big eater of battery on Android, so paying attention to this can literally extend your battery life by a few hours. 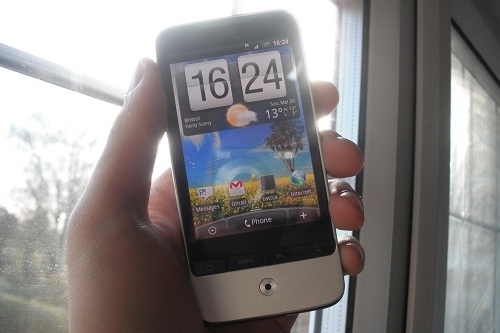 Sidebar: I have a friend who has his HTC Desire sync everything and frequently as possible, and only gets 5 hours with light use. Depending on what device you use, your screen can be a huge battery consumer. Looking under your settings at ‘battery use’ gives you a breakdown of the biggest battery consumers. On my phone, the display is always number one, so I set it to automatic brightness, which works much better than using manual brightness settings via the Android Power Control widget. Also, I like to take advantage of all the hardware, so I don’t see the point in having an ambient light sensor if you aren’t going to use it. Phones like the Legend, which have smaller screens, don’t tend to have the same battery issues as larger-screen phones like the Desire HD. Another interesting point to make is that if you’re using a device with an AMOLED screen, such as the HTC Legend or Desire or Samsung Galaxy S/Nexus S, using a dark background wallpaper can help your battery, as an AMOLED screen uses a lot of power to reproduce brighter, lighter colours. Depending on what kind of data plan you have with your device, you might want to think about and tweak your data connections. If you’re using your device on a pay-as-you-go basis, without data included, then you’ll probably want to keep your mobile data connection off when you’re out of range of a wifi hotpot. However, if you’re not a heavy data user, or simply don’t need your data connection that much and only want to make calls and send SMS, then keeping your data connection off will help to increase your battery life. You may also want to keep your phone on 2G (EDGE, GPRS) networks only, as 3G (UMTS, HSDPA) uses a lot more power; you’ll sacrifice quite a lot of speed, but if you’re not browsing heavily or downloading/uploading large files then 2G works fine. Of course, the best way to save battery juice is to do that old fashioned thing that is turning your phone off. If I’m on a long coach or train journey and asleep for most of it, I’ll just switch my phone off for four hours or so; it only takes a minute to boot up, and all of my messages and emails that were received during the ‘power off’ period arrive the moment I switch my phone back on. I was at a stage performance of King Lear last week, and I switched my phone off at the beginning while it had about 35% battery left, switched it on during the interval to reply to a few texts, switched it back off, and at the end of the play it was still on 30%. If I had left it simply on silent (how naughty of me) then it probably would’ve died at around the same time Lear did. Depending on what phone you have and how you use it, the steps above may or may not be relevant to you, but if you make an effort to pay attention to how your phone uses your battery, then you’ll be surprised at how much battery life you can gain. If you’re a root user, then there are even more steps you can take; an app called SetCPU controls the phone’s processor speed, which will also save you a ton of battery power if you get the settings right.